Dec 19, 2016: Help me ascend further! Dec 29, 2016: Which 1070 is the best? Dec 30, 2016: Is the GTX 1080 bandwidth starved? Feb 22, 2017: Aren't these benchmark results too high? Mar 03, 2017: What is the best gfx card for 400 dollars? Apr 02, 2017: Difference between two ASUS 1070 Cards? May 08, 2017: [Build Help] Looking for feedbacks and opinions on my first build before I pull the trigger on Amazon. Jun 10, 2017: Gigabyte GTX1070 G1 8008mhz vs ASUS ROG STRIX memory clock speed? Jun 20, 2017: Want to upgrade 780ti to 1000 series. Want some advice! Jun 20, 2017: [Build Help] Need help making a tough choice for my new build. Jun 22, 2017: First time build in a long time. Jun 29, 2017: [USA-CA] [H] Paypal, gtx 1070, NES classic, Razer Keyboards [W] NVIDIA GTX 1080, 1080ti. Jul 01, 2017: Cheapest 1070 is 465$, and cheapest 1080 is 480$: When will this misery end? Oct 04, 2017: What do you think of my build? Oct 16, 2017: Any cons when mining using an old prebuilt PC with new GPUs? Nov 26, 2017: Are this parts compatible? Feb 27, 2018: Should I OC an OC edition Strix? 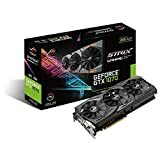 Sep 08, 2018: Is this a silent gpu? Apr 16, 2019: [Build Ready] Need to rebuild sooner than later, but can't decide among 3 versions.